This time of year, Minakami is an armchair agriculturalist's dream. 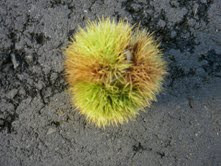 Everywhere, everyone is harvesting something. 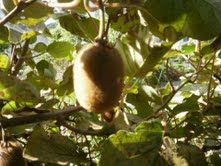 Why this past weekend alone, we spotted kiwis on the vine, mushrooms of every shape and size, chestnuts in their spiky casings, purple eggplants ready for picking, globe-like persimmons, apples (more on that later) and rice, rice rice! Located on the rim of Japan's rice bowl, the area is a patchwork of tiny, terraced paddies. 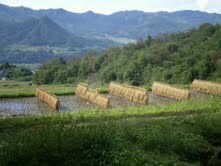 Basking in the autumn sun, the fields are now lined with golden stalks drying on makeshift bamboo racks. Amazingly, all farmers cut and hang the exact same way. The scene is so picturesque, straight out of an Impressionist painting. No wonder we rented the house. A weekend in Minakami would not be right without dropping by the mushroom lady who runs a tiny, mostly mushroom, produce shop on the road to Tsukiyono. In addition to shiitake, maitake and one other kind of fungi, we bought 5 kg. of new harvest rice. 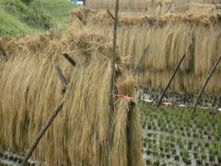 Having just arrived from the farmer, the rice was still in a big paper sack like this one with the the traditional twisted closure on top. We watched as she deftly ladled out the appropriate amount. And then threw in a little something extra. 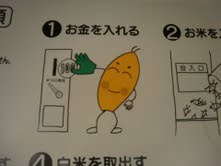 At the other end of the spectrum stands the rice vending machine. Though the quaint factor is missing, the convenience can't be beat. Located at the edges of parking lots, next to the takoyaki stand or drive-thru dry cleaner, they make it easy for motorists to pause and purchase 24 hours a day. Like an instant photo booth, you simply select the type and quantity of rice, deposit your money, as Okome-kun is demonstrating above, and then hold your chosen vessel under the spout as shown below.